What is Jet Set Sail? If you’re a passionate traveller who has embraced the world of cruising, chances are you’ll have heard the phrase Jet Set Sail. If not, it’s the newest offering from Celebrity Cruises, providing passengers the option to arrive in style on a private jet at their first port of call. What makes Jet Set Sail a unique addition to a cruise holiday is arriving in a VIP private jet. The aircraft will have 130 seats on board and will leave from Glasgow Airport. On-board, passengers can relax in Premium Economy with a seat pitch of 31” and will be treated to a 2-course luxury meal. There will also be increased luggage allowance of up to 25kgs and 5kgs hand luggage so travellers won’t need to worry leaving something behind. Jet Set Sail passengers will also be allowed to fast-track through security and will receive free car parking at Glasgow Airport. Customers who book an AquaClass stateroom or higher will also receive free lounge passes for Glasgow Airport. After arriving in style, passengers will be treated to priority embarkation. This includes a private coach transfer to the ship. 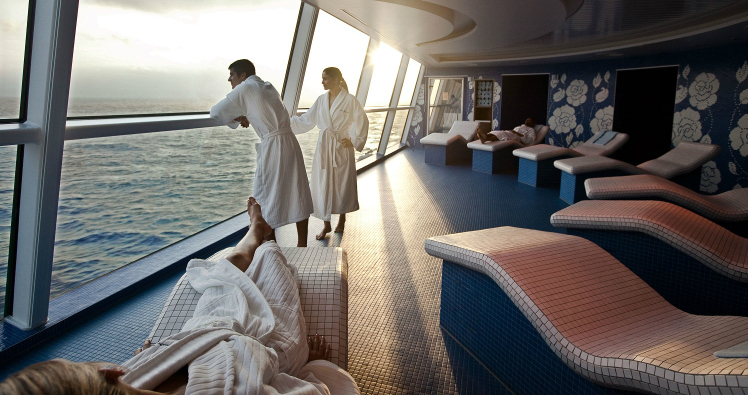 On board passengers will find the key amenities that make Celebrity Cruises such a popular choice. This includes the CanyonRanch Spa Club, the Celebrity iLounge, Michael’s Club private lounge for suite guests and the unique cuisine that Celebrity Cruises is famed for. Accommodation wise, passengers can rest their heads in either One of the 5 types of suites or the many classes of staterooms. The Celebrity Constellation also includes AquaClass stateroom s – an accommodation package designed with the spa lover in mind. Guests will be fully pampered during their cruise with exclusive access to the health-conscious restaurant, Blu, and unlimited access to many of the spa amenities. Barrhead Travel has two available Mediterranean sailings that offer the Jet Set Sail package. Sailing from Rome, Jet Set Sail-ers can choose between a 10 night cruise on the 24th of June 2017 or a 9 night cruise on the 22nd July 2017. On both cruises, passengers will dock in at Florence, Portofino, Nice, Provence, Sete, Ibiza, Palma de Mallorca and Barcelona. The 10 night cruise in June will also stop in Valencia. Prices for an interior stateroom start from £1464pp. Not only that but the second guest cruises half-price, and 3rd and 4th guests receive 25% off. Until 30th November, 1st and 2nd passengers will also receive free drinks. Jet Set Sail is one of Celebrity Cruises biggest offers, and the Glasgow package is exclusive to Barrhead Travel. You can find out more details of Jet Set Sail on our website.